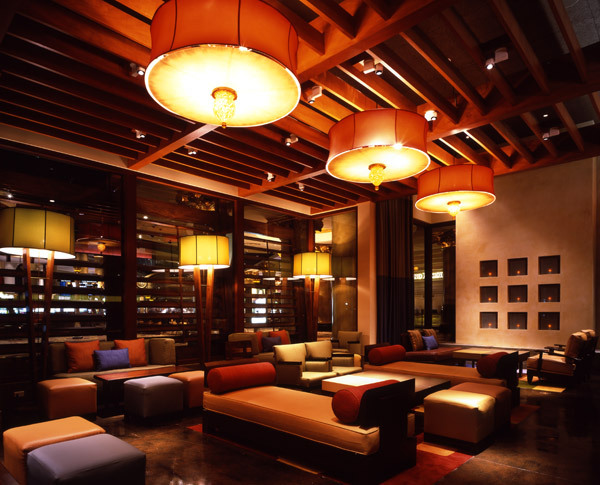 It is rare to find an award-winning restaurant within a business hotel in the US. One exception is the Santa Clara Marriott, home of Bradley Ogden's Silicon Valley restaurant, Parcel 104. Named after the original lot number on which it sits, this restaurant features a daily changing menu. The cuisine is contemporary Californian which usually means vegetables from small organic farms and artisan ingredients sourced locally. The restaurant, like the rest of the hotel, is spread out over a large area. The use of dark wood furniture, bronze accents and indirect lighting gives the place a warm, comfortable character. The tables are large and well-spaced out which was good since the place was quite crowded when I walked in on a Friday evening. The menu said Farmers Market Friday's. 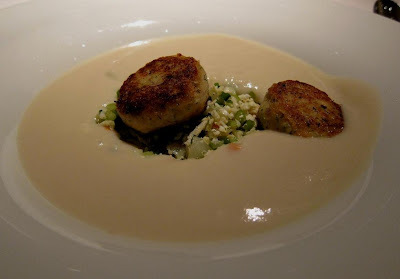 After contemplating the Foie Gras for a while, I decided to go for the Cauliflower Soup. The florets from the cauliflower had been shredded to create a 'cauliflower cous cous' and topped with smoked fish cakes. The waiter then added the tarragon-sherry 'perfume' at the table. The soup was interesting and felt good. 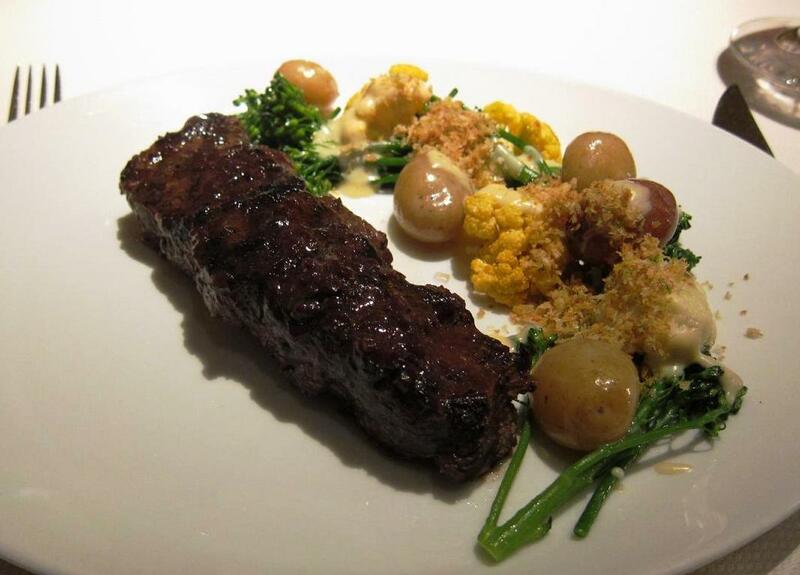 Next came my entree, the 'all natural' Flat Iron Steak. Served with marble potatoes, brocolli and with a 5-year cheddar fondue. This dish was very good and I savoured every bite. Finally, I settled for the Spanish Custard. 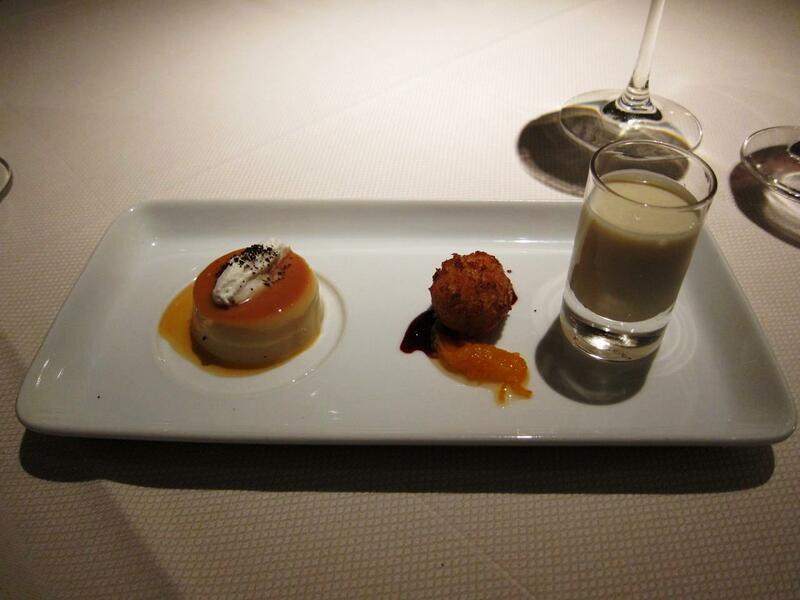 The dessert consisted of caramel flan, cheese beignets and a creamsicle milkshake. A nice, sweet ending to the meal. 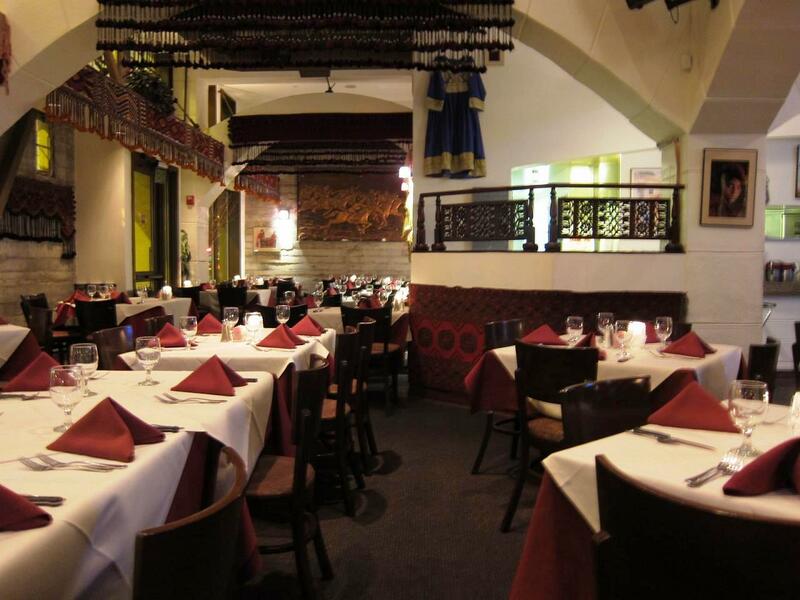 Overall, this is definitely among the better places in the South Bay area for a business dinner or even a special evening. I also found a Afghan restaurant called Kabul in Burlingame this time when I was near San Francisco airport. Unsurprisingly, the food had familiar flavors of Indian and Persian cuisine, but there were some interesting differences. 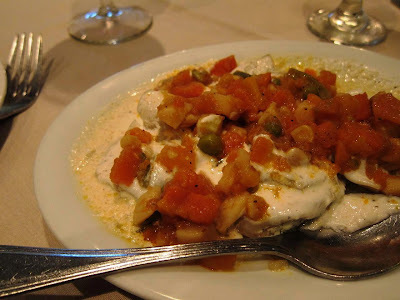 Mantoo, small dumplings filled with minced lamb and served on whipped yoghurt, onion, tomatoes and other vegetables was a twist on the Indian chaat. I also ordered a kabob platter that came with two skewers, one of lamb and the other of chicken. 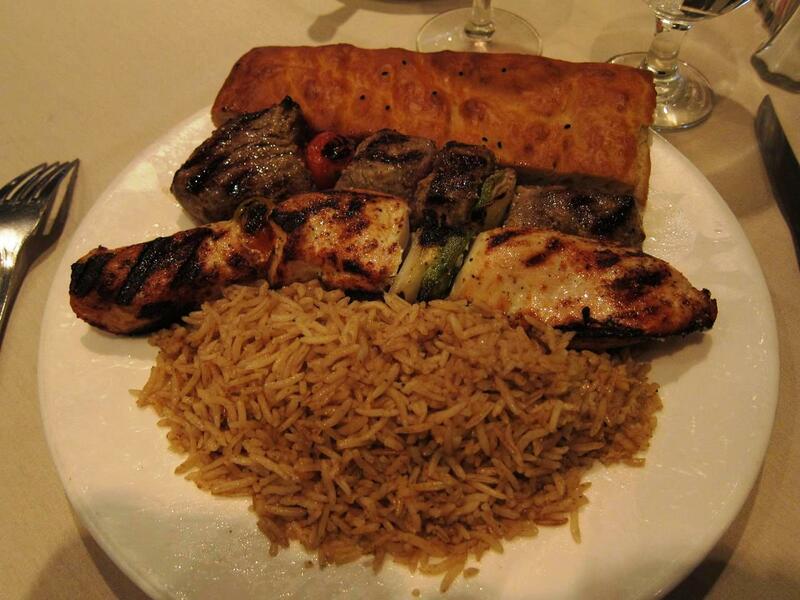 The kabobs were served with fragrant basmati rice and a loaf of Afghan bread. The kabobs were very succulent and filling. I ended with a thick syrup-filled baklava. Last time I had Burmese food in this city and this time Afghan. Even though both countries are in the neighbourhood of India, it is only in the USA that I can sample their cuisines.